And Mike Bloomberg is not the only victim in today’s Quinnipiac poll. Council Speaker Christine Quinn is too. Bloomberg, who had an approval rating in the 70s, has slipped nine points and is in the 60s for the first time in two years (He is exactly at 66, compared to a high of 75). Quinn, however, is seeing the lowest approval rating of her tenure — at 40 percent. The highest rating she has ever seen was in March of 2007 at 51 percent, according to the poll. Dara L. Miles reports on how anything involving the New York City schools can spawn a controversy. The Department of Education is working to change the way breakfast is served in New York City’s public schools in pursuit of a laudable goal — getting more kids to eat that first meal of the day. New York schools have been offering free breakfast since 2003. Teachers, administrators and advocates agree that a nutritious breakfast improves student concentration and performance, but participation in New York’s program has been low. Only one in five students ate breakfast at school in the 2006-2007 school year, giving the city’s schools one of the lowest participation rates in the country. A report has emerged on the Times quoting two close confidants of Sen. Hillary Clinton, who say she would take a position in President-elect Barack Obama’s cabinet as Secretary of State. If the Times is correct, pols in New York could be looking for a promotion. The service provides real time information on road and transit routes via phone or the Web so that you can know what to expect before you leave home. Users can now call 511, free of charge, and get information on any mode of transportation in the New York City area, including parts of New Jersey and Long Island. (The service is planned to be rolled out statewide by January next year.) Those outside of the service region can call 888-GO-511-NY. A voice recognition system delivers service updates on highways, bus routes, and number of other options. If the system itself doesn’t have access to the data a user seeks, it will transfer them to the appropriate agency. With 347 transfer options, callers can find information on anything from para-transit to ride sharing. Updates are available to the public within seconds of an interruption in many cases. 511NY.org offers expanded options, including a trip planner that uses Google maps. Many users may just use Google Transit. But that service doesn’t account for service interruptions like the 511NY planner. Planned interruptions are also in included. New York’s 511 is unique in the country as it is the only service to offer regional data that crosses state lines. “We want to get this fully turned on before the holidays,” says Todd Westhuis, 511 NY’s project director. Despite widespread community opposition, including charges that the city’s proposal is racist and discriminatory, the City Council is set to approve a rezoning plan for the Lower East Side of Manhattan. The plan would cap building heights at 80 feet and include set asides for affordable housing. In certain areas of the rezoning, which includes more than 110 blocks, affordable housing would make up 20 percent of the building. Both council members that represent the district, Rosie Mendez and Alan Gerson, support the plan. At a press conference just now, Council Speaker Christine Quinn said the rezoning plan was initiated by the community in an attempt to protect the character of the quickly gentrifying neighborhood. The plan, council members added, preserves the diverse population. Much of the opposition was from populations in surrounding communities, like Chinatown, who feared gentrification would spill over onto their streets once the Lower East Side had height restrictions. Gerson said the deal with the administration would include funding to protect those communities from developer harassment and fast-track rezonings for their own streets. This is the latest rezoning of more than 90 that the Bloomberg administration has put forth since taking office. It was a voila moment for the City Council. After the director refused to say whether the administration could rescind the rebate on its own sans City Council approval, Weprin flailed an “ah ha” document in the air. The administration had previously asserted that it did not need the City Council to approve the withdrawal of the property tax rebate, which many members oppose. The municipal bond document, however, was drafted with the help of the Office of Management and Budget and clearly states that the legislature’s approval is a necessity. “I would suggest you contact (city Corporation Counsel) Michael Cardoza immediately,” said Weprin. Schools Chancellor Joel Klein got a friendly reception from the city’s school administrators at the annual union’s annual conference Saturday afternoon. But the tone changed after he ducked out and union president Ernest Logan took the podium. Logan, who heads New York’s Council of School Supervisors and Administrators, tweaked Klein for not wearing a tie and touched on some more substantive disagreements with the administration. These include early childhood education and, above all, the structure the mayor has devised to run the city’s public schools. In announcing the union’s report — “Rethinking Mayoral Control” — Logan said he expects mayor control to continue when it come before the state legislature next spring. “I’m a realist,” he said. He then went on to list how the union would like to see the system improved. Did Bloomberg Overact to Ruling on Hybrid Cabs? Hate Walmart, But Love Trader Joes? When Mayor Michael Bloomberg began discussing his plan to weather the deteriorating fiscal climate, he said he remained committed to important infrastructure projects. “If you don’t pay for infrastructure, you pay for it many, many times down the road,” the mayor declared. Nonetheless, one week later a plan for school construction was discretely released which slashed the number of schools to be built nearly in half. But is there a way for the city to maintain a solid footing in the face of an economic storm and also continue to build infrastructure projects? Comptroller William Thompson thinks there might be. At a Crain’s breakfast last month, he floated the idea of infrastructure as an investment for the city’s pension funds. “Such an investment could help further diversify our portfolio and fulfill our fiduciary goals in terms of return on investment, while addressing the urgent need to repair and expand our roads, bridges, power plants, and schools,” he said. Domestic infrastructure is an area of growth “that will continue to see demand,” he added. The projects funded would likely not end up within the city, however. The New York City Council today approved zoning changes that pave the way for two ambitious redevelopment projects in Queens. City officials say the Willets Point redevelopment plan in northeast Queens and the Hunters Point South plan in Long Island City will provide thousands of affordable homes for middle-class and low-income families. Of the two proposals, the Willetts Point plan has drawn the most criticism, much of it from some of the 200 small businesses, which will be forced to relocate. Most of the businesses — many of them auto-related — operate out of facilities leased from the landowners. The city has reached agreements with some owners to buy more than half the land involved, but may use its rights of eminent domain to acquire the rest. While Council Speaker Christine Quinn hailed the vote as “a great day for the borough of Queens,” other members expressed concern over the use of eminent domain, but voted for the zoning changes anyway, saying that the benefits — housing, jobs and an environmental clean up — were too important to ignore. Still two members, Anthony Avella and Charles Barron sided with the businesses and voted “no,” and councilmember Letitia James abstained, because she is a plaintiff in a lawsuit against the city challenging a previous use of eminent domain. The Department of Education spent about $135 million on its cherished accountability initiative last year, according to an Independent Budget Office report released today. While such a number — most of it going for central office expenses, not teachers and classes — looms large in an era of cutbacks, at a press conference this morning Public Advocate Betsy Gotbaum, who requested the report, and her staff seemed more focused on what that figure does not include — and on the reaction from the department — than on the bottom line figure. The spending, estimated to come in at around $105 million this year, includes progress reports, surveys and money paid as performance bonuses to school and principals. The largest chunk — $29 million last year — was for the schools’ controversial ARIS computer system. The total includes money to pay the 79 people reportedly working in the accountability office. Although the Department of Education cautions that all jobs are subject to budget constraints, it lists six open positions working on the accountability initiative. The jobs seem notable for their opaque titles (director of knowledge management, KM domain leader for leadership and organizational management, summative assessments product manager) and salaries of up to $170,000. Oh the endless saga of the New York City press pass. How we loathe thee. But maybe the wretched ordeal of being denied time and time and time again will finally change in this era of new New York media. Three New York City journalists, with the help of civil rights attorney Norman Siegel, have filed a federal lawsuit against the New York City Police Department for denying press passes. The police have stonewalled these journalists and not given them any explanation for their denials. We here at Gotham Gazette feel their pain. Since the summer of 2007, we have been denied a press identification card, which would assist us in accessing certain crowded/exclusive City Hall events. The NYPD’s reason: that we are online only, sans a tangible, ink-stained print publication. UPDATE: On its site, the education department now has a spreadsheet with results for high schools only. It’s still not exactly easy to use but might prove more user friendly than the single one for primary and secondary schools. Click here. City high schools received their report cards today from the bosses at Tweed Courthouse and, as with elementary schools and middle schools, grades are up. According to the Department of Education press release, 57 percent of schools kept their A averages or move up by at least one least grade since the first report cards last month. One hundred twelve schools — or 39 percent — got As, including all the city’s so-called specialized schools (Stuyvesant, Brooklyn Tech, LaGuardia, etc.). Only 2 percent, or a total of six, city high schools flunked. The department advises parents and eighth graders now in the thick of the high school selection process to use the progress reports to help make their selections. But they expect parents to do a lot of clicking and downloading. The list of grades for all schools are available in a cumbersome Excel spreadsheet here that mixes up all grade levels and includes some information parents will find extraneous. Getting a report for an individual school requires going here, filling in the form, waiting for search results to come back and then clicking to download a PDF of the report card which, on my computer at least, was very slow. So what was Borough President Scott Stringer’s grandest revelation at the Manhattan beep’s office? It’s likely no one would notice if he didn’t show up to work. “I called (Bronx Borough President) Adolfo Carrion. And he said, ‘They never call. Let’s have lunch,'” Stringer recalled. That was nearly three years ago. Now, he claims, he has changed the way the office works. Gov. David Paterson’s budget cuts are in, and he plans on slashing $5.2 billion over two years. The cuts will come from everywhere, according to a press release. In what could cause the most backlash, the governor wants to cut $585 million from this year’s state school aid. The governor also proposed to raise CUNY and SUNY tuition by $600 and cut $41 million in municipal aid to New York City. He also plans on shutting down the “underutilized” juvenile facility in the Bronx, the the Pyramid Reception Center. All of this is in response to the state’s crippling financial deficit, attributed to the dreary economy and fiscal crisis gripping the nation. Mayor Michael Bloomberg announced the city’s response to the fiscal crisis last week, which included a 7 percent property tax increase, the discontinuation of a $400 property tax rebate and layoffs. You can get a full look at what gets slashed here. While most Americans wait to see who President-elect Barack Obama will appoint as secretary of state or treasury, some New Yorkers have focused on the less weighty post of secretary of education (and for five points who holds this job now?). Once the rumor surfaced that Schools Chancellor Joel Klein might get the nod, New Yorkers involved in schools reacted fast — and in many cases furiously. Term limits, well, it just brings people together. Who would have thought former deputy mayor during the Giuliani administration, Randy Mastro, would ever partner with Norman Siegel, former director of the NYCLU and candidate for public advocate, (both pictured here) on civil rights litigation taking aim at City Hall? Who would have imagined that Councilmember Charles Barron, a former Black Panther, would stand side by side with Comptroller William Thompson Jr. to criticize the absence of democracy in New York City? Term limits, though, did just that. 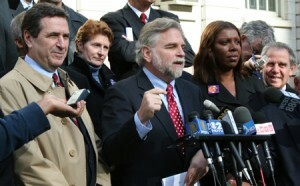 This afternoon Democrats and Republicans, liberals and conservatives appeared on the steps of City Hall to announce they had filed a lawsuit against the city, Mayor Michael Bloomberg, Speaker Christine Quinn, the Board of Elections and its president as well as the 29 council members who voted to extend term limits from two to three terms. They say the suit violates the first and fourteenth amendments to the U.S. Constitution, creates a disincentive for citizens to vote and chills the right to political speech. About 7,000 city employees must file financial disclosure forms to the city’s Conflicts of Interest Board every year. Last month, the 51 members of the City Council filed theirs. For more on the board, check out our Issue of the Week: The Public Principles Police. Though council members make a six-figure salary for their time in City Hall, it is technically a part-time post, and many members have another job — from attorneys to heading nonprofits. They do have to let the public know how much they make outside of their day jobs — albeit through a range not an exact figure. For more on the law, click here. Topping the list is Michael McMahon — the congressman-elect from Staten Island, who has served on the council since 2002. McMahon moonlights as an attorney at the law firm of O’Leary, McMahon & Spero on the island. He earned between $250,000 and $499,999 there last year.